Adriana is a 10-year-old from Mexico studying in the fourth grade. She lives with her mother, Julia, and six other children. Her father is deceased. 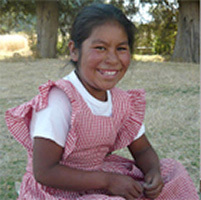 Despite facing her fair share of struggles early in life, Adriana is a cheerful girl. “I love to climb anywhere, play in the tubes of the slide at the school playground and play soccer. I also like to play with dolls and to paint and draw,” said Adriana. When she grows up she would like to be a painter and for this reason has a special book for drawing. But for now, with simple plastics, sticks and strings, Adriana enjoys flying her homemade kite. Tyrel’s father has been a carpenter since he was a teenager. Tyrel spent a lot of time with his father and watched him work, assisting him in whatever small way he could. It is through his father that Tyrel developed the art of making his own crafts beginning at age eight. “I loved playing with toys but my parents were not always able to afford them and the ones that they occasionally bought did not hold together for long,” said Tyrel. 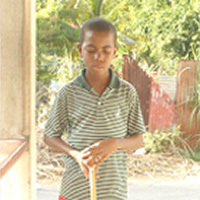 Instead, Tyrel used local materials such as boards, glue, nails and sometimes paint to make his own, unique, more durable toys. Through the power of play, Tyrel has become very skilled in making these toy and has begun making other local items such as clocks, guitars and even fishing boats. Tyrel has also become a great help for the family in repairing home furniture or making new pieces and fixing electronics such as the radio. Tyrel takes a lot of pleasure in using his skills to create toys for and help his family. 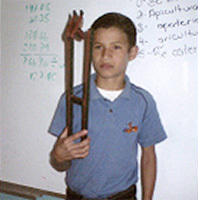 Nollan, a 13-year-old boy from Honduras knows the value of using recycled materials to enhance his own creativity. "In my community we make toys out of recycled materials such as plastic, wood, metal bottle caps, strings or rope and work with hammers and nails." "Every year I make a toy I call “The Trapeze Artist” and I am making it again this year. Once the toy is made I have a lot of fun playing with it in my free time. I also lend it to my siblings and friends so all of us can have a good time. "I like making toys because it helps use my creativity and utilize materials that are in my community. What I like the most about this toy is the clown can turn in many positions, as if it was real." Draw the trapeze artists on a piece of wood. Cut the wood with the right measures. For rough wood, use sandpaper to polish. Make holes in another piece of wood and assemble.